The rumors are true! Apple has finally released their highly-anticipated 4K 21.5 inch iMac today alongside brand new versions of their accessories; the Magic Mouse 2, Magic Trackpad 2, and new Magic Keyboard. Rumors for the new iMac started way back when the first OS X El Capitan beta came out when someone noticed code inside the OS X build stating that there was support for an iMac with a 4K display. Whispers about the new accessories started when the FCC leaked some patents Apple filed back in August for a new "Magic Mouse 2" and an updated Wireless Keyboard, which has been renamed to "Magic Keyboard". Let's do a quick run down of all the new products Apple released today. The new 4K iMac features a 4096x2304 display, the same resolution as the rumors. This gives you 9.4 million pixels to do your work on. The display features a P3 color gamut, which features a 25% larger color space for more detailed and more life-like image reproduction. 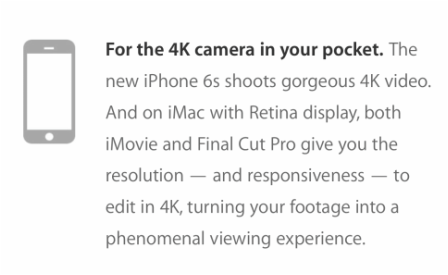 This is one of very few ways to view 4K video in the Apple ecosystem, considering the new Apple TV 4 doesn't support 4K content. On the inside of the new iMac, you'll find a fifth-generation Intel Core processor with updated Intel Iris Pro graphics. The new iMac is priced from $1499. Apple also made some updates with the 27 inch 5K iMac. Now, you'll find the computer with the latest AMD Radeon R9 graphics cards and sixth-generation Intel processors, starting at $1799. That's only $300 more than the base line 4K model, so if you need more screen real-estate, just invest another $300. ​Apple is also changing up the Fusion Drive configuration options to make it more affordable. You can choose a Fusion Drive that pairs a 1 TB hard drive with 24 GB of flash memory for fast application and data cache. A higher end 2TB and 3TB HDD with 128 GB SSD is also available. The new Retina 4K iMac is available online and at Apple retail stores today. 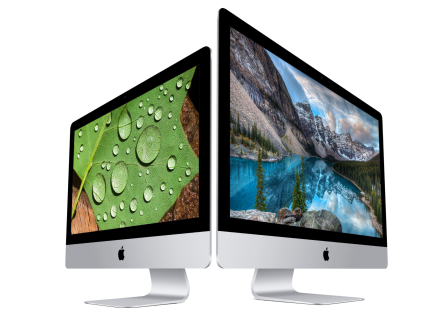 The new 27 inch 5K iMac with updated specs is also available at the same locations. Wanna take a walk down memory lane? Apple has published a new page on their site titled "Then and Now", displaying the differences between the very first iMac and the brand new one released today. You can visit the page here. Below is a gallery of screenshots from the webpage linked above. The new Magic Mouse 2 is practically identical to it's predecessor. All the changes are mainly internal other than the lightning port on the bottom to charge the mouse since the battery is rechargeable and the slightly longer design. The new Magic Mouse 2 requires a Bluetooth-enabled Mac with OS X 10.11 or newer to operate, so if you've got the previous Magic Mouse and your Mac doesn't support OS X El Capitan, don't think about buying this mouse unless you're gonna upgrade your Mac as well. The price has gone up for this new model to $79 as opposed to the previous price of $69 for the older model. The new Magic Trackpad 2 is slightly bigger than it's predecessor, with plenty of new features to go around. The Magic Trackpad 2 requires a Bluetooth-enabled Mac with OS X 10.11 or newer running, so it's basically the same story as the Magic Mouse 2: if you're thinking about buying this trackpad but your Mac can't run El Capitan, forget about it. ​The trackpad is available from Apple retail stores and online for $129, up from the previous $69 price point of the previous model. I guess the old Wireless Keyboard wasn't magical? The new Magic Keyboard has gotten most of the changes wen compared to the two previous products listed here, especially the name and the keys themselves. The Magic Keyboard requires a Bluetooth-enabled Mac with OS X 10.11 or newer, so if you need a new keyboard for that 8 year old Mac, you're out of luck (at least in this department). The keyboard will run you $99, which isn't exactly cheap for a Bluetooth keyboard. Leave a comment down below with your thoughts on the new products from the major tech company known to the world by the name of a fruit!